Do you always look angry or tired even when you feel fine? You can erase unsightly wrinkles in 10 minutes. It’s not a miracle.it’s Botox. Aesthetic Concepts belongs to the Distinguished National Cadre of Physicians in the Botox Network Program. As skin becomes less elastic over time, repeated frowning creates visible lines and wrinkles. This results in crow’s feet, forehead wrinkles and frown lines. Botox is a purified protein that temporarily relaxes muscles, causing existing creases to fade and preventing formation of new ones. The tiny infections take only minutes to perform and the effect becomes apparent in days. You may return immediately to your daily activites. To prevent lines from reappearing, a simple touch-up two to three times a year is recommended. Botox is used to soften fine lines and wrinkles in forehead (frontalis), between eyebrows (glabellar) and around eyes. Each area will take a certain amount of Botox to see the full effect. Every person is different in the amount of Botox it takes to see the desired results. Our Botox is priced at 12.00 per unit. If a whole 100 unit vial is purchased, then it is priced at 10.00 per unit. Schedule your complimentary consult today and discover how this procedure can benefit you! 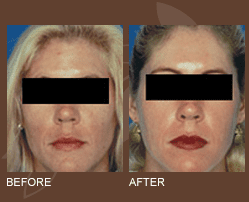 All patients are different, results depicted in the photographs are not necessarily representative of all results, and individual results may vary.